Nazis and Fascists, oh my. “You had some very bad people in that group. You also had some very fine people on both sides,” he [Donald Trump (r)] added. To amend chapter 173, RSMo, by adding thereto two new sections relating to higher education. (c) Pressures a student to engage in conduct or expression contrary to a sincerely held religious belief or not to engage in conduct or expression motivated by a sincerely held religious belief. 73.1560. 1. No public institution of higher learning shall take any action or enforce any policy that denies a religious student association any benefit available to any other student association, or otherwise discriminate against a religious student association with respect to such benefit, based on that association’s requirement that its leaders or members adhere to the association’s sincerely held religious beliefs, comply with the association’s sincere religious observance requirements, comply with the association’s sincere religious standards of conduct, or be committed to furthering the association’s religious missions as such beliefs, requirements, standards, or missions are defined by the 9 association or religion upon which the association is based. 2. No public institution of higher learning shall substantially burden a student’s exercise of religion unless the institution can demonstrate that application of the burden to the student is in furtherance of a compelling interest of the public institution of higher learning and is the least restrictive means of furthering that compelling interest. (3) Further the organization’s mission or purpose, as defined by the student organization. 4. Any student, religious student association, or political or ideological student organization that has been aggrieved as a result of a violation of this section may assert that violation as a claim or defense in a judicial or administrative proceeding against the public institution of higher learning and obtain appropriate relief, including damages, against that institution. 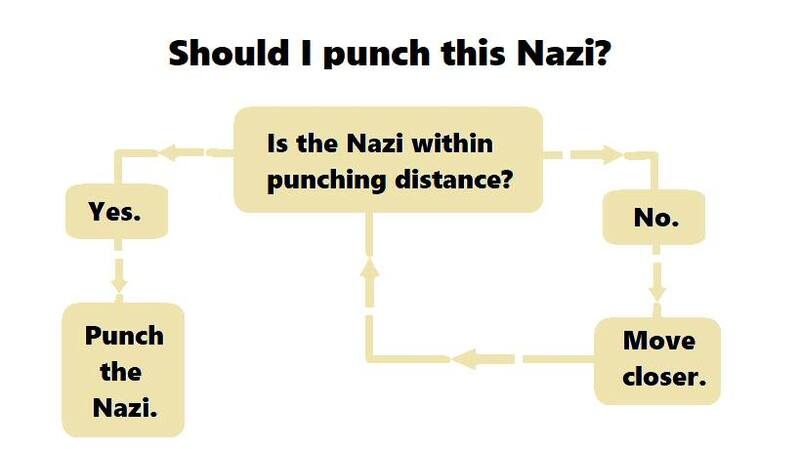 Does that mean that you can’t punch Nazis? Just asking. HB 837: Asserting equal opportunity to resurface their playgrounds? Representative Hannah Kelly (r) [2019 file photo]. 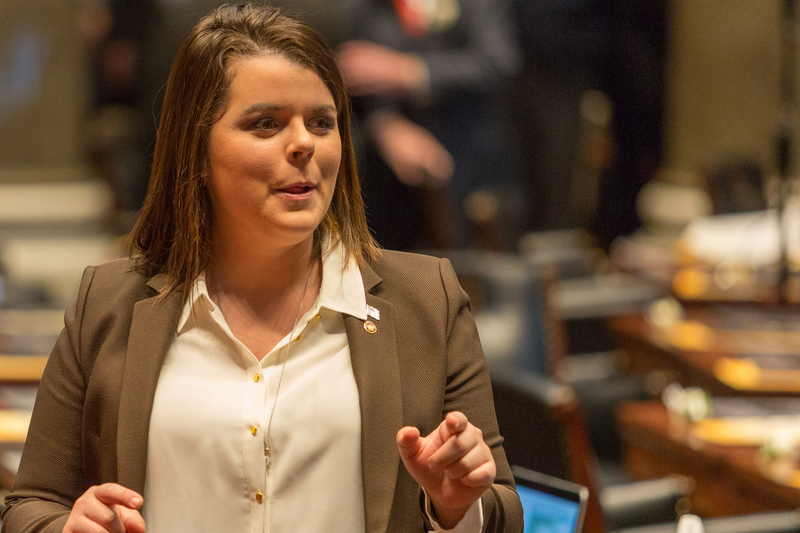 This bill prohibits public institutions of higher learning from taking any action or enforcing any policy that denies a religious student association benefits available to other student associations. The bill also prohibits discrimination against a religious student association based on its requirement that leaders of the association adhere to its sincerely held religious beliefs, religious practice requirements, or religious standards of conduct. The bill also authorizes aggrieved religious student associations to seek appropriate relief in a judicial or administrative proceeding against a public institution of higher learning that violates the requirements of the bill. This bill is similar to HB 2074 (2018) and HCS HB 642 (2017). If Pastafarians want to hold a spaghetti dinner on campus on Talk Like a Pirate Day would that qualify? Would this exempt them from having to provide a separate sauce for vegetarians? Just asking. University of Central Missouri President Chuck Ambrose [2016 file photo]. As Missourians, we all have a stake in our state’s economic success. As such, we should be cognizant of critical factors that contribute to stronger communities which also mean better public schools for our children and services to improve the quality of our lives. While our state faces budget challenges, higher education continues to be an exceptional asset in helping to meet economic as well as social goals, and citizens deserve a strong public policy in support of colleges and universities as an investment in the public good required to drive Missouri’s future forward. Continued reductions in appropriations for higher education are only hindering the opportunity to maximize the potential these institutions provide the state, and most importantly, directly to its people. Growing jobs and creating an environment that stimulates the economy for all Missouri residents is the goal. Studies show the value of a college degree includes an enhanced lifetime earning potential of $1 million more for graduates versus those without a degree. Additionally, a well-educated workforce is good for local businesses seeking to broaden their consumer base. Amidst a growing need for the state to be more competitive on a global level, we must consider who is going to provide training for a workforce that is well prepared to seek out new markets for home-grown goods and services overseas. Evidence of Missouri’s desire to enter this realm includes a recent bid to bring Amazon’s second headquarters to Kansas City. A globally competitive environment for business requires a globally competitive commitment to higher education, and public higher education institutions are ready to respond. Some 359,492 students are currently served by post-secondary education throughout the state. 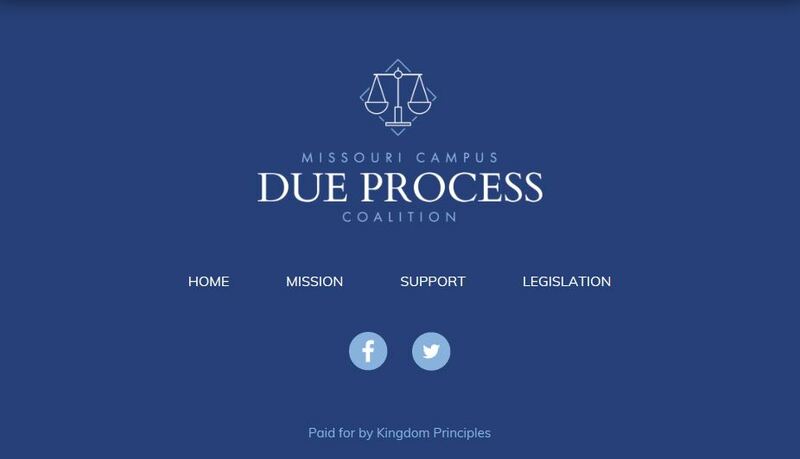 Collectively, we must ask ourselves how do we value these students’ place and the impact 27 public and 25 private campuses hold within Missouri’s public policy agenda? If they are important, then the current divestment trend must be reversed. In order for higher education to achieve its full potential as an economic driver, there must be a stronger commitment to funding Missouri’s colleges and universities to ensure that students are not priced out of the opportunity to earn a degree. Institutions themselves also have a role in exploring and implementing new initiatives to help meet accessibility and affordability goals so that students do not bear the burden of rising educational costs and an escalating college debt load. But higher education institutions can’t do this alone. During the past two decades, state support for public higher education has decreased dramatically, from 65 percent of Missouri public institutions’ total revenue to about 35 percent currently. Using the University of Central Missouri as an example, the net state appropriation for Fiscal Year 2018 was $52.7 million, considerably below the $57.9 million budgeted net appropriation for FY17. This is almost a $400 decline in funding per student in one year. Unfortunately, maintaining an accessible, affordable education will not get easier as the Missouri governor’s recommendation for FY19 funding dips to the 2004 state appropriations level. 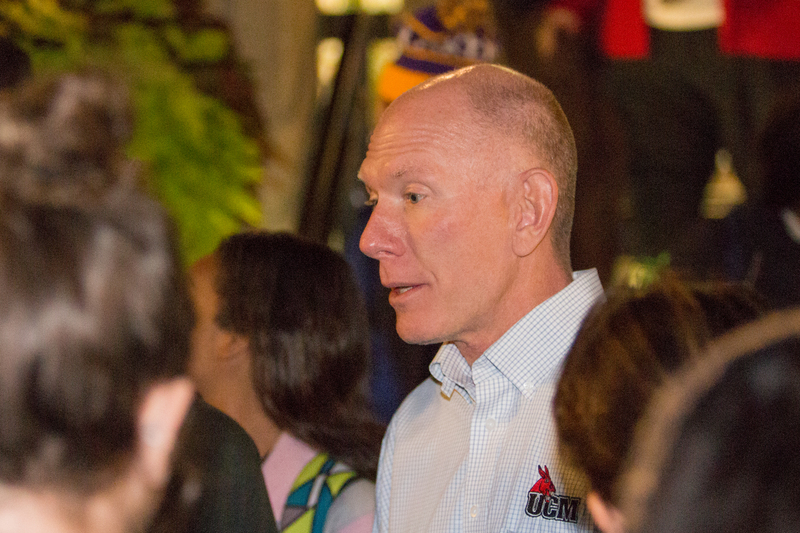 While the decline in state funding presents a financial challenge, at UCM the focus on student success has meant finding ways to keep students from shouldering the impact of these revenue declines. This means keeping tuition below the consumer price index while still maintaining a quality education; an aggressive completion agenda; maximizing opportunities to create public K-12-higher educationbusiness partnerships such as The Missouri Innovation Campus and Innovation Track programs that reduce the time to degree completion and students’ debt; and becoming the first institution to implement the 15-to-Finish Scholarship concept to keep students on track for timely degree completion. By contributing to a better economy, higher education can help break the cycle of poverty across the state. Meeting this goal also includes serving many first-generation, low-income students who are pioneering the education trail for their families. 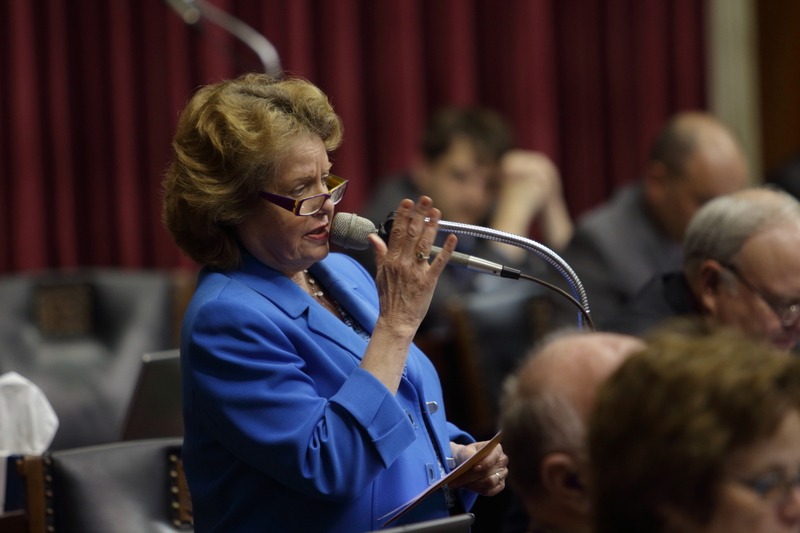 Considering the benefits of a higher education, it is hoped that future public policy will recognize the value proposition Missouri colleges and universities represent for the state. Public institutions are positioned to deliver opportunities that will drive local economies, but more state support is needed to ensure costs are not passed onto Missouri families and that access to college and its affordability remain attainable goals. 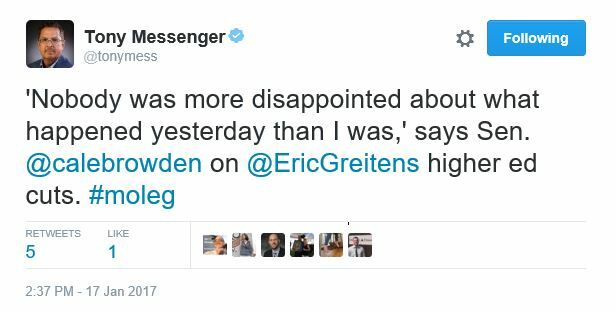 Not that Eric Greitens (r) particularly cares. Rep. Judy Morgan (D) [2016 file photo]. To amend chapter 174, RSMo, by adding thereto one new section relating to higher education tuition policy, with an emergency clause. 174.820. 1. This section shall be known and may be cited as the “Missouri Tuition Equity Act”. (5) In the case of an individual who is not a citizen or a permanent resident of the United States, the individual provides the higher education institution with an affidavit stating that the individual will file an application to become a permanent resident of the United States at the earliest opportunity the individual is eligible to do so. 3. No Missouri higher education institution that receives any state funds whatsoever shall deny admittance to a student based solely on his or her immigration status, provided the student has satisfied the requirements of this section. 4. Any information collected under this section as part of a student’s admission shall remain confidential. Section B. Because of the importance of providing educational opportunities for Missouri high school graduates, this act is deemed necessary for the immediate preservation of the public health, welfare, peace, and safety, and is hereby declared to be an emergency act within the meaning of the constitution, and this act shall be in full force and effect on July 1, 5 2018, or upon its passage and approval, whichever occurs later. Investment in education by the state is essential for every individual and the future of the state. Modifies the exclusions from “lucrative office or employment” for senators and representatives holding employment other than their elected office. Upon voter approval, this proposed Constitutional amendment allows members of the General Assembly to hold certain compensated positions with the state or political subdivisions including employment with police departments, firefighter departments, secondary schools or public colleges or universities, and part-time employment that is compensated at less than $20,000 annually with a political subdivision or special district. As if public colleges or universities will still exist as we know them by the time this becomes law? Who’s going to pay for this new unfunded mandate? To amend chapter 170, RSMo, by adding thereto one new section relating to the Missouri higher education civics achievement examination. 170.013. 1. Any student pursuing an associate’s or bachelor’s degree from a public or private institution of higher education, except those attending private trade schools, shall successfully pass an examination on the provisions and principles of American civics with a score of seventy percent or greater as a condition of graduation from such institution. The examination shall be known as the “Missouri Higher Education Civics Achievement Examination”. 2. The examination required under this section shall consist of at least fifty questions, but shall not exceed one hundred questions, and shall be similar to the one hundred questions administered to applicants for United States citizenship by the United States Citizenship and Immigration Services division of the Department of Homeland Security. Subject matter on the examination shall include the United States Constitution, the United States Bill of Rights, governmental institutions, historical manifestations of federalism, and history of constitutional interpretation and amendments. 3. The examination required under this section may be included within any other examination that is administered on the provisions and principles of the Constitution of the United States and the Constitution of the state of Missouri, and in American history and American institutions, as required in subsection 3 of section 170.011. 4. Institutions of higher education may use online testing to comply with the provisions of this section. I could be good with this if the members of the Missouri General Assembly had to take and pass the same test before they could be sworn in. But we should expect a higher passing score from them, right? Representative Rick Brattin (r) [2013 file photo]. To repeal section 173.1004, RSMo, and to enact in lieu thereof two new sections relating to public institutions of higher education. 173.940. Notwithstanding any other provision of law, no public institution of higher education in this state shall award tenure to any person who is hired by such institution for the first time on or after January 1, 2019. The provisions of this section shall not apply to employees hired prior to January 1, 2019. Why, this seems rather punitive in nature. It appears that any understanding of the concept of faculty tenure and the implications for faculty recruitment and shared governance escape the representative. He should, perhaps, bother to ask someone who does. 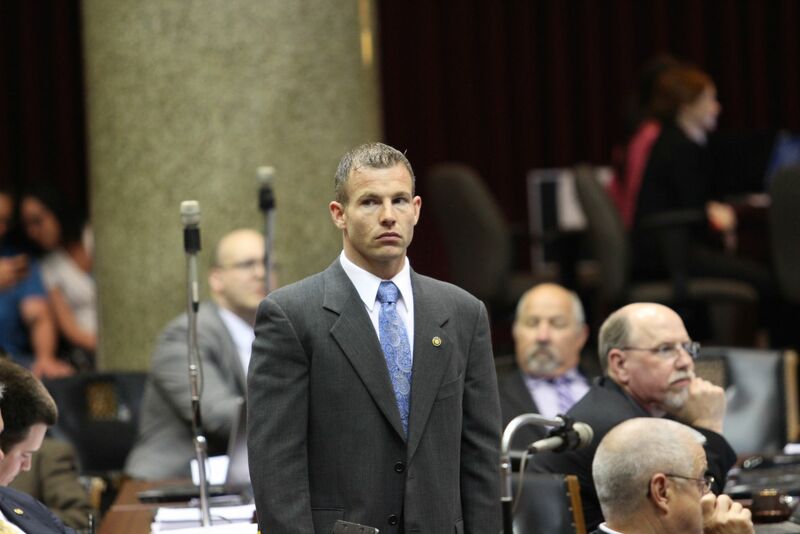 Rep. Brattin is a 1999 graduate of Lee’s Summit High School. Well, that could explain some of it. These three facts, budget cuts, loading the university governing structure with business people, and pointedly stressing “intellectual diversity” – shorthand in rightwing circles for inculcating conservative viewpoints in higher education – reflect the influence of both the shadowy and the more overt conservative supporters of Kid Greitens, the folks he needs to please if he expects them to fund his future presidential aspirations. Intellectual Diversity: While intellectual diversity in academia is an admirable value, the phrase itself has taken on a life of its own in conservative circles. Most notably, it has been popularized in rightwing circles by the reprehensible bigot and conservative provocateur, David Horowitz – who is funded by the Scaife family foundations, the Koch brothers’ DonorsTrust, and the Bradley Foundation, all of which, according to Jane Meyer in her book, Dark Money, have attempted to establish conservative beachheads in American universities. Horowitz has used the term to justify witch-hunts to eliminate what he deems undue leftist influence on campus as well as his demands for what amounts to affirmative action for conservative academics in humanities and social sciences faculties. In the mouth of Kid Greitens, recipient of over two million dollars of that same “dark money,” likely from one or the other of the same spigots that fund folks like Horowitz, the phrase should raise the hackles of all fair-minded advocates for higher education. Responsible apologists for conservative thought such as Mark Lilla have noted that the “hysteria” whipped up by the intellectual McCarthyism of those like Horowitz who agitate for one-sided “intellectual diversity” contributes “to the dumbing down” of higher education. Market-based educational priorities: At least two of the appointees to the Board of Curators are drawn from the business world. Jeff Layman, who was also the finance chair for the Greitens campaign, is a senior vice-president at Morgan Stanley. Jamie Farmer runs a company that supplies materials for fracking operations. Both supported Eric Greitens’ campaign financially, and it’s safe to assume that they’re hunky-dory with his intimation that he wants to introduce “intellectual diversity” to the University, very likely to the detriment of the more traditional understanding of diversity, intellectual or otherwise. It is also likely that, as at other institutions with governing boards that are top heavy with business types, they will try to move the University into more of a supporting role for business and corporate interests, giving priority to the training of engineers, accountants and other cogs of industry – and, incidentally, to disciplines where the dreaded “liberal bias” is less pronounced. Another goal may be to decrease the institutional control of faculty and administrators who are viewed as untrustworthy by many wealthy conservatives. Greg Lewis at The Century Foundation observes that public universities are now predominantly governed by boards that skew toward businessmen and women who are often at odds with the values of the institutions they oversee. He claims that their approach fails to “reflect the broad diversity of fields and experiences at public institutions,” and instead emphasize decision-making that is hasty, top-down, often uninformed and reflecting market-driven rather than intellectual priorities. Cracking the Budget Whip: So it seems that Greitens has hinted at his goals for MU: “intellectual diversity” that emphasizes conservative philosophy and values, the elevation of intellectually neutral, technical disciplines, and the devaluing of more traditionally liberal areas such as humanities and social sciences. His appointees to the board seem likely to find these goals simpatico. He only needs one more thing to facilitate the type of change he seems to be promising to initiate: a crisis. Arizona has reduced its spending on higher education by 41%, zeroing out its contributions to two community colleges entirely. Meanwhile, the libertarian Koch Foundation has stepped into the void, offering funding to Arizona State in return for favorable treatment of their ideas inside the institution. Conservademia: Jane Meyer remarks in her book that the 1969 Columbia University protests by Afican-American students were the catalyst that helped initiate conservative efforts to turn American universities rightward. Similarly the complaints of the MU African-American Concerned Student 1950 group stirred latent racist indignation in the state and left Missouri right wingers fuming at what they saw as administrative capitulation to the demands of the Black students. There are clear signs that Kid Greitens is going to try to ameliorate such conservative criticism of the university’s administration while furthering the educational agenda of his conservative supporters. Indications are that he will be just as willing to take aim at liberal campus culture and try to shift it rightwards as he has been to go gunning for labor unions. The guy who in his campaign ads literally aimed a big gun on what he metaphorically designated Jefferson City political culture, may soon declare open season on campus liberals. Governor Eric Greitens (r) has ordered significant budget cuts, with higher education taking a significant hit. 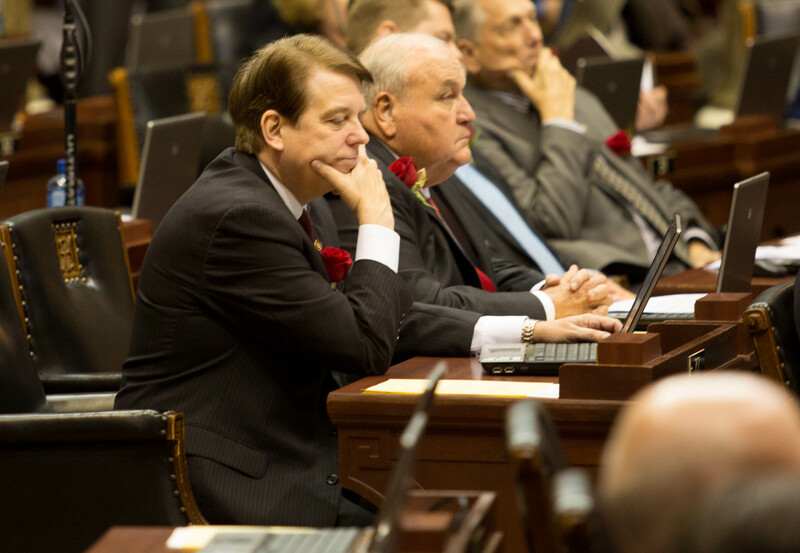 Over the years the republican controlled General Assembly has cut back the possibilities of revenue, creating a death spiral of diminishing revenue and continuous cuts in public investment. 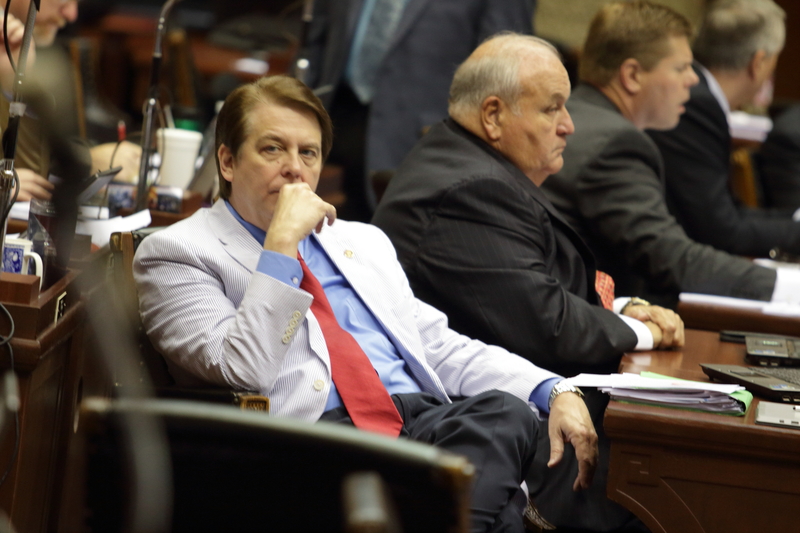 On May 6, 2014 the republican controlled General Assembly overrode then Governor Jay Nixon’s (D) veto of SB 509, an ill conceived bill which further exacerbates these same budgetary shackles and insures the Kansasfication of Missouri. 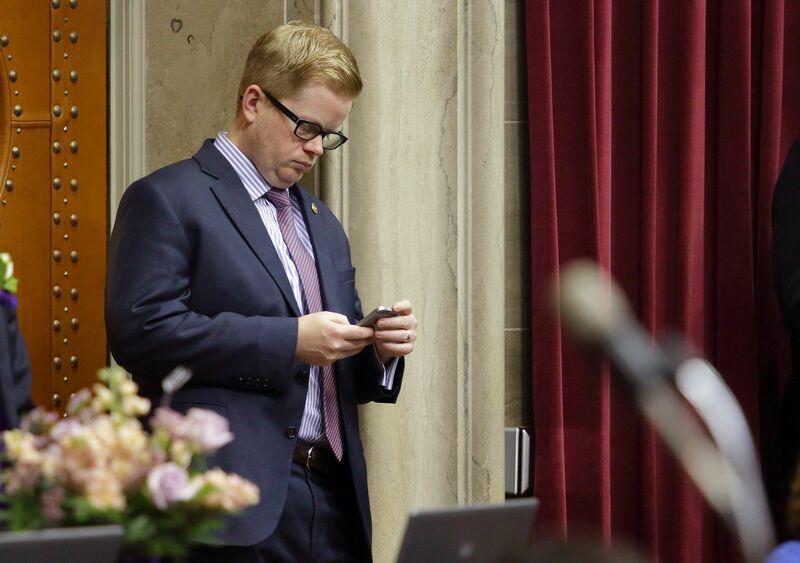 Then Representative (now Senator) Caleb Rowden’s (r) disappointment over the hits the University of Missouri (in his district) would take wasn’t evident (r) on May 6, 2014 when he voted [pdf] (Journal of the House, 1578) to override Governor Nixon’s veto.